I wanted to do a few things in my closet before showing it to you guys but since I mentioned about my closet resolution here, I thought what better time to just go head and show you..so welcome to my closet! When we designed this house, the original plan was to have a joint closet sitting on top of the garage. Not that I care that much about how big/small my closet was going to be but I wanted my closet to serve as a refuge space for me. Something special that makes me smile every time I walk in (just like a man cave if you will). The engineers made a mistake and was discovered late in the process. Long story short, we not only had to down size the closet but also had to split one big closet into two smaller ones in order to make the structure works. This is my closet and the husband has his own on the other side of the bedroom. Disappointed? Yes, at the time but looking at my closet now, it's probably best that I have a smaller closet or else I would not able to fill it. For those who are wondering, my closet is 6'x 12'. Products pictured: High back adjustable bar stool, IKEA storage boxes, Singer sewing machine. When I moved from the old house to the apartment, I donated 1/3 of my closet. I got rid of some more when I moved from the apartment to the new house. My closet now is half the size of what it was a year ago. As you can see here, I only use half of the closet’s capacity. There's plenty of extra space for future acquisitions. Sure, there definitely were “I have nothing to wear” moments but the reality is I love having a smaller wardrobe but filled only with items I love rather than a huge closet filled with disposable items. 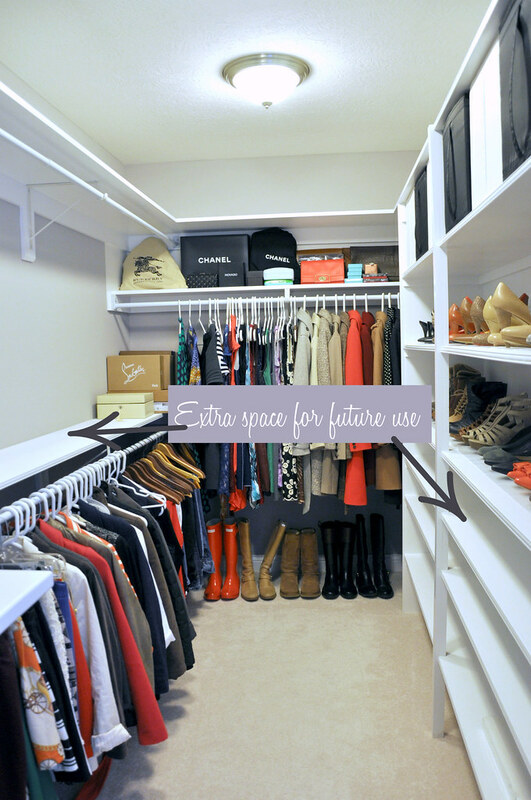 That brings me to the next point – my new closet resolution! If you’re a long time follower of this blog, you know I've always been a thrifty girl when it comes to clothes. I do have a few things I splurged on without regrets but the majority of my closet was purchased on super, duper clearance somewhere. Then I realized that was my problem. Because I am a sucker for sales, I often came home with items that I didn't actually love but bought because well, they were on sale. Those items ended up in the back of my closet after a few months. To avoid that, my new closet resolution for 2014 is to only stick with one item per month. If I only get to have one new item for the entire month, I will be less likely to buy on a whim, on impulse or on incentive (i.e: on sale). This also ensures that I love that one item enough to give up shopping for the rest of the month (sounds depressing, I know =). That item may cost me $50 or $500. I wanted to concentrate on things that I actually need/love instead of the price tags. I am not going to lie, it was really tough to pass up sale items for the past 3 months. Being a style blogger, it's so easy to get caught up in the moment and go on a shopping spree but I was able to stick with my resolution for the past 3 months. I would love for you to join the “one item per month” challenge with me and hope you enjoy my “closet tour” nonetheless. I am planning to hang some artworks, replace all hangers, and switch out the ceiling light with a mini chandelier in the very near future. It came out lovely Sydney! Love, LOVE your closet, Sydney! The layout's great and just looks so well thought out (I hate unusable space in the corners). I remember you talking about a sewing station in the planning stages, so I'm glad to see that made the cut in the end. You know, it can also double as a vanity (assuming you don't already have space in the bathroom or elsewhere). Your closet came out WONDERFULLY even if it wasn't as you and H originally planned. Your little sewing station is super darling, too! And I totally get your goal of One Item Per Month- I'm a real sucker for buying things on sale, too. I am also a sucker for sale/clearance items. It will be hard to resist! Good luck! I usually buy first then try on at home for a few days and see if I do really love it. If not, I'll go back to return. This does require a lot of back and forth though. Ooh, this is SO fun to see! And you know, you're probably right about the "mistake" being a good fortune in terms of closet size. I have had various closets over the years and there are definitely advantages to a smaller one. You do think a lot more carefully about what deserves that precious real estate and what does not! I'm not sure I can join you on one item a month because I'm still refining my wardrobe for a new climate, but I'm excited to hear how it goes for you! You closet is amazing!! I love the sewing station... I don't know how to sew more than a button but that would still come in handy! You have a great shoe collection, too!! I love the space, Sydney! And the sewing station is such a great idea, although, my fabric stash is getting so big so fast, I would need way more storage space!! Absolutely love all the home tidbits we've been seeing here and on IG! Please do more soon! Great challenge! I will join you since I miserably failed my resolution on 2 items per month. Starting afresh for the spring. 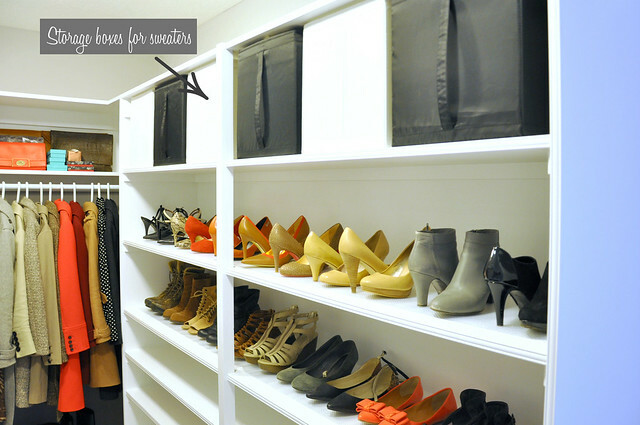 I'm jealous of all that space for storing shoes :) Your closet looks amazing! Good for you about the closet resolution! 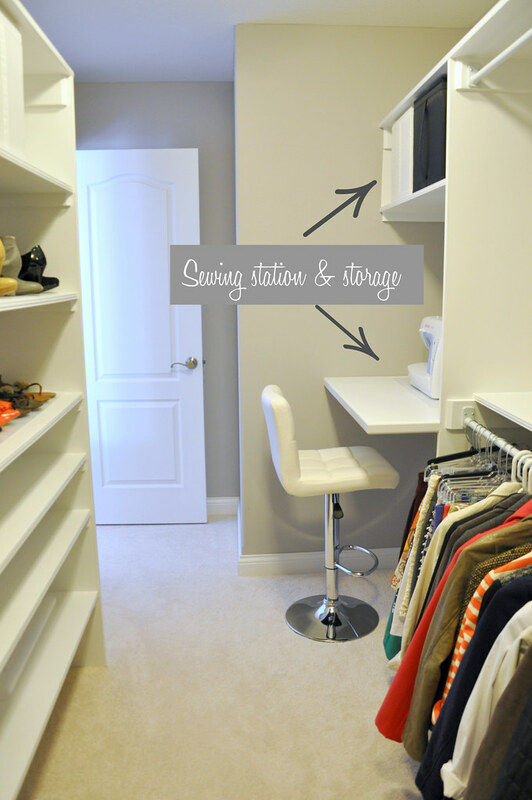 I love your paired-down and organized closet and that the sewing machine is RIGHT there. Definitely makes alterations easier and hopefully done in a shorter amount of time. I have stuff from last summer still not altered. That's a really well-thought-out closet space. Love all these home features! Please continue to share them! This is so very cool! I absolutely love your one item a month idea...right now I am not shopping at all (for lent) but I may consider joining you in this. For a long time I was in a similar situation. As long as anything was under $10 and it fit, I pretty much bought it. Now I'm trying to stay away from places like Forever 21 and buy things I can see myself wearing for years to come. Looks great, I have the same Decoration hanging dress the Room.. I love the big potted fig trees too.. really great!! Have a great weekend! Love those grey booties on your shelf (second picture). What are they? @JudeThey're super old booties from Banana Republic. More pics can be found in this post. I really like your closet and its so big. Very nice, Sydney! I love how organized this is and that you even have a sewing station. Good for you on getting rid of 1/3 of your closet, I need to do the same! I love your forward thinking about using your closet and not dumping everything there for storage or filling it up w lots of clothes. I'm a recent convert to quality over quantity when it comes to clothes. I value the same thing in food so why not clothes? I wish I had your closet!